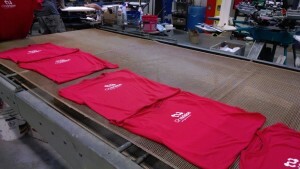 AMBRO Manufacturing is a Contract ScreenPrinting company located on the East Coast in New Jersey. We are situated in between New York and Philadelphia and provide Contract ScreenPrinting services to the trade. AMBRO Manufacturing is been in the garment, fabric and textile decorating industry for over 30 years. We have the experience, equipment and passion to provide you with the absolute best results. Each job is unique and requires a good amount of communication with our customers. All of our production is complete in house. We do not offshore our production. Our in-house production capabilities include: Contract ScreenPrinting, Contract DTG, Contract Embroidery, Contract Sublimation, Contract Applique, Contract Jumbo ScreenPrinting and Contract Cut and Sew. We operate out of a 15,000 square foot solar powered facility in Flemington, New Jersey. AMBRO Manufacturing understands that quality, turn around time and fair pricing are essential to building strong and long lasting customer relationships. Our staff take pride in their work and all have direct contact with our customers. Our unique production system informs our customers each step of the way and allows them to track the progress of their jobs through our production plant. AMBRO Manufacturing believes strongly in keeping the lines of communication open and that’s why you can always get us on the job. Unique to the industry, AMBRO Manufacturing has a division of work strategy. This means that the person that takes your order is not the person that prints your order, packs your order and ships your order. Each task is separated and assigned to a specialist. This strategy enables us to stay efficient and produce our jobs on time every time. If you are interested in Contract ScreenPrinting, please consider giving us a call (908) 806-8337 or email us.